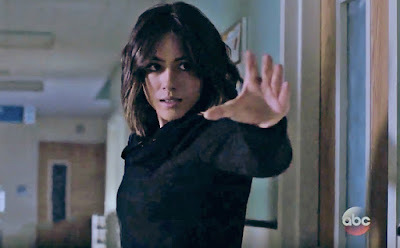 The human formerly known as Skye is now Agent Daisy Johnson (Chloe Bennett) and in full control of her powers as an Inhuman. She and Phil Coulson (Clark Gregg) keep searching for other Inhumans to help before they hurt themselves or others while trying to control their powers. The 'Agents of S.H.I.E.L.D.' season three trailer sees Daisy in action but there's a new threat lurking around the corner. The aftermath of last season, fighting rogue Inhumans,finds our heroes fractured and dealing with their own issues. Coulson has to try and get the team focused and unified while also tracking down Inhumans. One of them is seen in the trailer not dealing very well with his newfound powers.